La verdad es que el título tiene un poco de trampa. No es que los vascos, o los seguidores de las costumbres vascas, hayan abierto un Txoko, o Sociedad, en esa ciudad de Florida. En realidad se trata de un restaurante de cocina vasca inaugurado por el chef Henry Salgado, que ya tiene un restaurante (ese de cocina española) en ese mismo Estado. 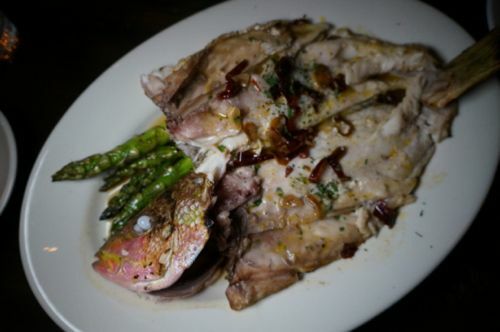 For some years now, Spanish River Grille has been one of Central Florida’s best restaurants. But since it is extreme East Central Florida, ie New Smyrna Beach, it wasn’t the sort of place those of us in the Greater Orlando area just popped in to. So when chef Henry Salgado and his wife, Michele, announced that they would be opening a restaurant in Orlando — at East End Market, no less — food fans got very excited. The anticipation abated only slightly when it was learned that the restaurant wouldn’t be Spanish River Grille West. Curiosity was the next stage when the name was revealed. “What’s a Txokos?” people wondered, silently because they didn’t know how to pronounce it. And then everyone moved on to waiting as the restaurant, which involves a new structure that abuts the existing East End Market building, was erected, finished and permitted. The final stage is enjoyment, because Txokos Basque Kitchen was worth the wait.